Consistency is key to helping your presentation look professional. Make sure the same fonts are used throughout – if you use one font for the header and a different one for the main body text then make sure this is the same on every slide. One quick way of doing this is to set up your Master Slide. Another way is to use the Replace Fonts feature in PowerPoint (click here for my tutorial on how to do this). The same goes for bullet points, if you use a formatted style of bullet point then make sure the same style is repeated every time. Check your spelling. If you use the American way of spelling certain words with a “z” instead of an “s” e.g. realize instead of realise, organize instead of organise, then make sure you’re consistent. Slides shouldn’t just be paragraph after paragraph of text. Try to make them visually appealing and interesting. Use different formats of bullet points instead of just the standard black dot. Try using a symbol or special character or even a picture unique to your brand. 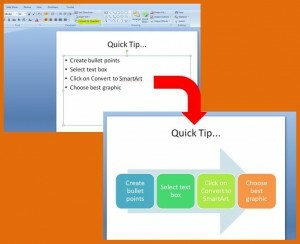 Alternatively change your bullet points to graphics instead using SmartArt. These are all tools available in PowerPoint version 2007 onwards. Be as creative as you dare! Instead of double clicking your presentation to open it, try right clicking on the file name and choosing Show. This launches straight into the slideshow without revealing any of the slides to the audience first (click here to see how). If you want the audience to focus on what you’re saying instead of the slide at any point during the slideshow, just press b on your keyboard and this will black out the screen. Press b again to get your slides back. The same applies if you press w which turns the screen white instead of black.